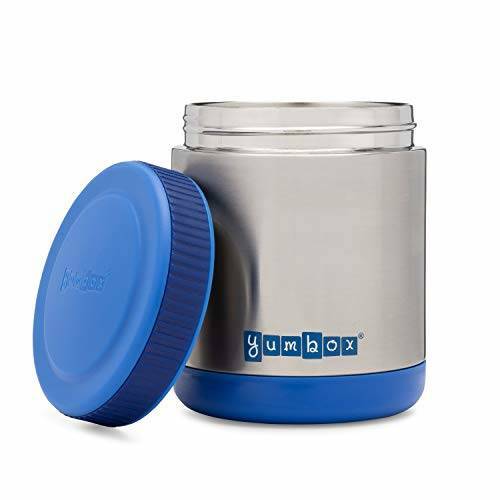 PACK HOT & COLD: Yumbox Zuppa Triple Insulated Stainless Steel Thermal Food Jar makes it easy to pack hot or cold food items. Food stays warm for over 6 hours and cold for up to 12 hours. PRACTICAL DESIGN: Designed with a wide 3.5 inch opening that makes it easy to fill and eat out of Yumbox Zuppa. The lid is surrounded by a non-slip silicone band. The bottom has support feet to stabilize the food jar when eating. We made sure to design Yumbox Zuppa to be easy to open and close, even for young kids. Yumbox Zuppa works well for children and adults! PERFECT SIZE: Dimensions: 4.7 in (h) x 3.9 in (w), Portion size: 14 oz, 1.75 cups. Pack satisfying soups, stews, rice and beans, fruit salads or pasta dishes. EASY CLEANING: Hand washing only. No microwave. Lid gasket removable for easy cleaning. HIGH QUALITY, DURABLE & LIGHT: Triple Insulated 18/8 (304) food grade stainless steel; FDA, CPSIA compliant and BPA-Free; weighs only 11.3 ounces.